Last Updated: January 12, 2019 · Published: December 4, 2017 By: Asian Caucasian 6 Comments This post may contain affiliate links or sponsored content. I love substituting bread (=carbs) for crisp lettuce leaves to help keep the calories down (and to maintain my waistline!). 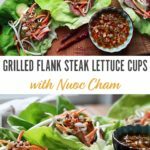 These Grilled Flank Steak Lettuce Cups are the perfect lettuce wrapped meal and are a cinch to make and assemble. The marinade for the flank steak is super flavorful, and the fixins’ add the texture (shredded carrots, sliced cucumbers, bean sprouts, and cilantro). The lettuce cups are topped with a drizzle of Nuoc Cham, an awesome Vietnamese dipping sauce, that will tingle your tastebuds. More please! 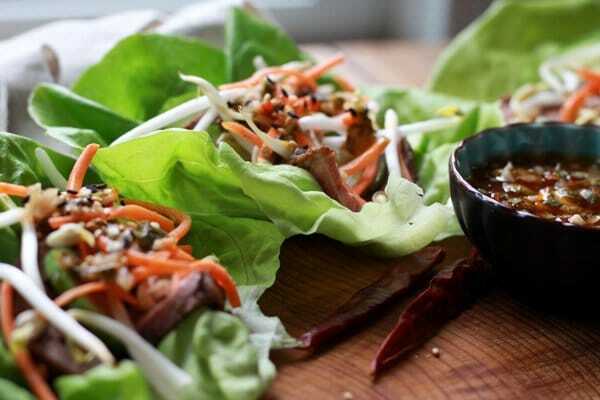 These Grilled Flank Steak Lettuce Cups are incredibly flavorful and oh, so healthy! 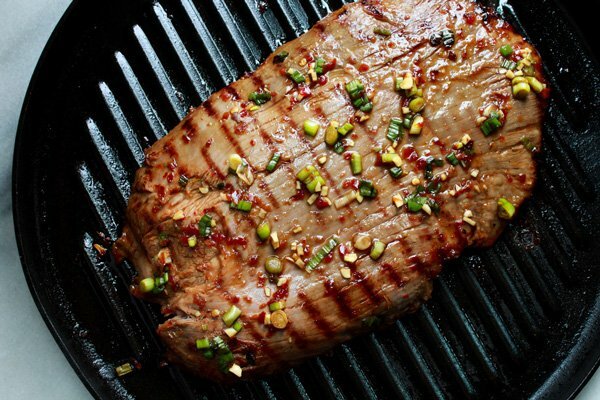 Choose a nice cut of steak and marinate the flank steak with our special marinade in the fridge for 1-2 hours. Grilled to perfection! You can use a grill pan or take it outside on the BBQ grill! The flank steak grills to the perfect temperature — so tender! Let it rest for 10 minutes on a cutting board before slicing and adding to the lettuce cups. 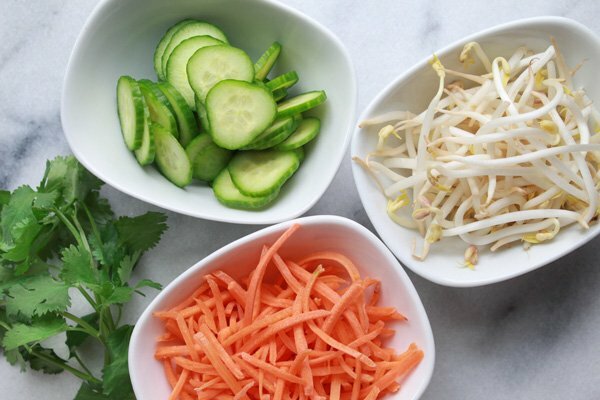 The toppings for the lettuce cups — thinly sliced cucumbers, shredded carrots, and bean sprouts. 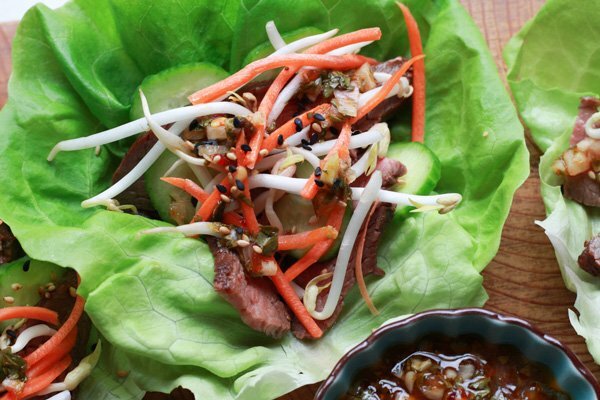 Assemble the Grilled Flank Steak Lettuce Cups with a butter lettuce leaf. Top with our Nuoc Cham drizzling sauce! 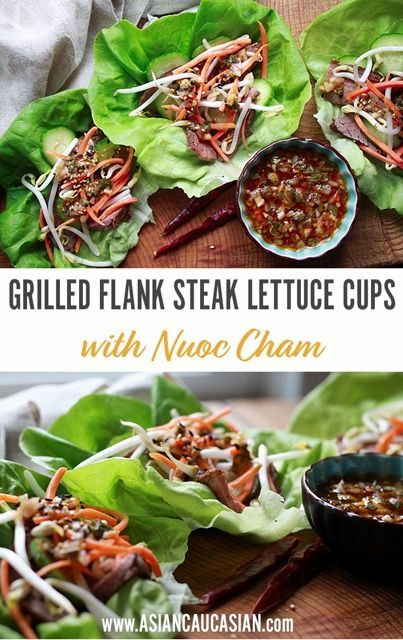 Nuoc Cham is a Vietnamese dipping sauce that can be used for many purposes, including the drizzle for these Grilled Flank Steak Lettuce Cups! These Grilled Flank Steak Lettuce Cups are the perfect lettuce wrapped meal and are a cinch to make. They are incredibly flavorful and oh, so healthy! 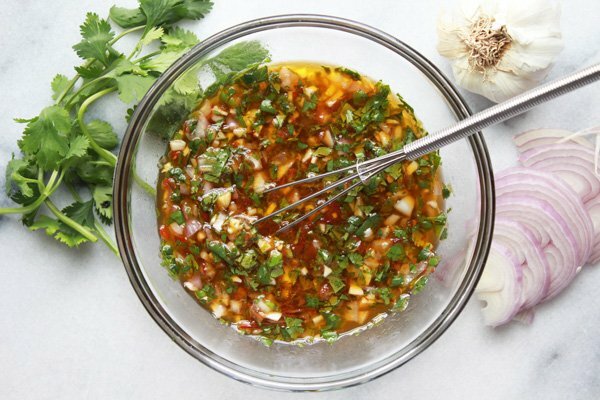 To make the marinade: In a small mixing bowl, whisk together the soy sauce, rice vinegar, rice wine, sesame oil, borown sugar, sambal oelek, garlic, and scallions. 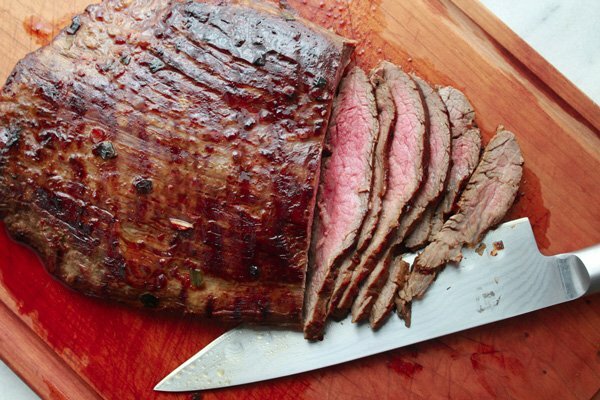 Place the flank steak in a large glass baking dish, or plastic sealable baggie. 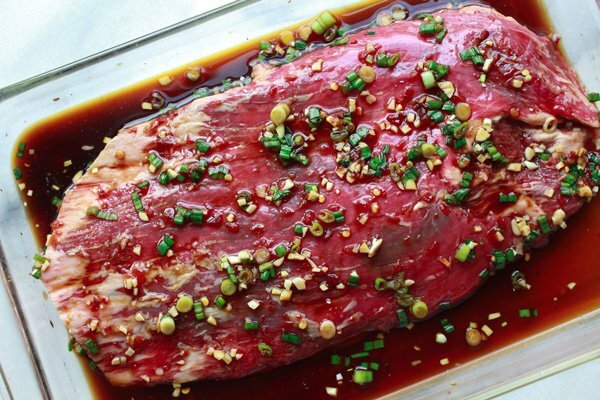 Pour the marinade over the flank steak and let marinate for 1-2 hours in the refrigerator. Remove from refrigerator and let it get to room temperature, about 15 minutes. Using an outdoor grill, or grill pan, coat with cooking spray over medium-high heat. Grill the steak for about 6 minutes each side, or until cooking to medium. Remove to cutting board and let rest 10 minutes. Slice the meat across the grain. 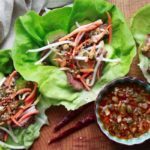 To make the lettuce cups: Place a few pieces of steak into the lettuce leaf and top with carrots, bean sprouts, cucumbers, and cilantro. Drizzle with nuoc cham dipping sauce and sprinkle with sesame seeds. 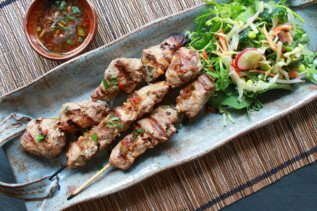 Click here for the Nuoc Cham dipping sauce recipe. I love all the fresh veggies in this dish! Thank you, Ashley! These are so easy and healthy! Great for a post-holiday meal!